After all the rain of the past few days (or is it weeks? ), the rain stopped by 9 o’clock on May Day so we were able to get out for the Tuesday ride. The ride was more of a ramble than a ride. The weather still being unpredictable, I made the route up as we went along, thus if it did start to rain again we could head straight for the tea room where we had arranged to meet John and Meike. As it transpired the weather improved with each passing mile and the sun actually came out before we had meandered over 20 miles on our way to The Bakery at Tadworth. 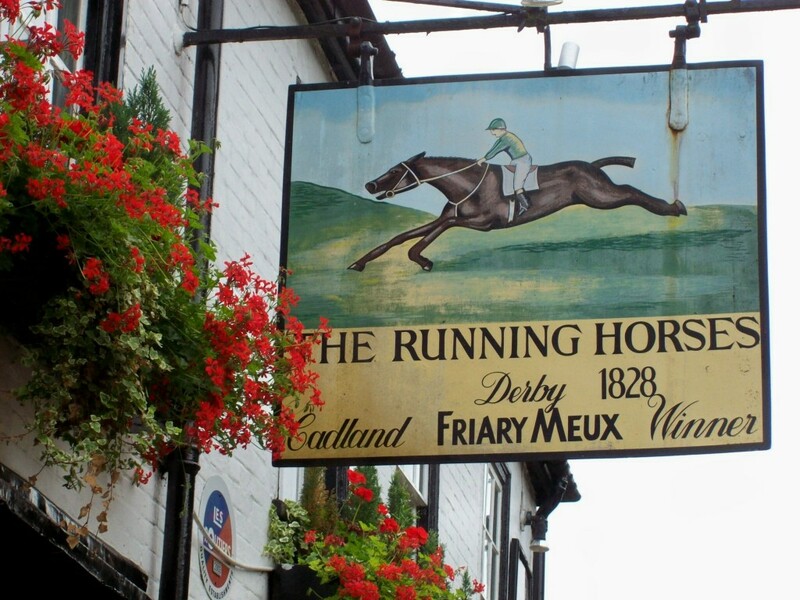 The outward leg took us down thru Little Switzerland, and into Mickelham with its 16th century coaching inn, the Running Horses. In my first few years in the Anerley we often went to the Running Horses for the New Year’s Day ride. They served a most delicious Turkey Hot Pot, using up the left overs from their Christmas dinners. But the Anerley have been using this pub for many years. The earliest Anerley Gazette that I have seen, lists a Saturday afternoon ride from Purley Cross to the Running Horses in May 1903, close on 110 year ago! 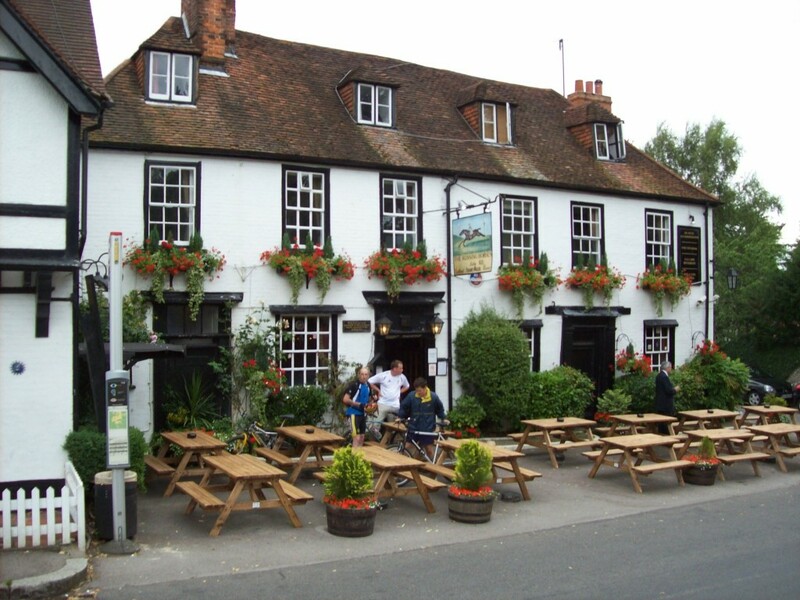 There is an interesting story to this old coaching inn, formally known as The Chequers. After a long day on the road, weary travellers could while away an overnight stop with a meal and a small wager over a gaming board. Then in 1828 two locally trained horses ended the Epsom Derby with the first and only dead heat. The two famous “Running Horses” and what became known as “The Dead Heat Derby” are immortalised in the renamed inn! One side of the pub sign shows the horse named Cadland, and the other side the horse named The Colonel. 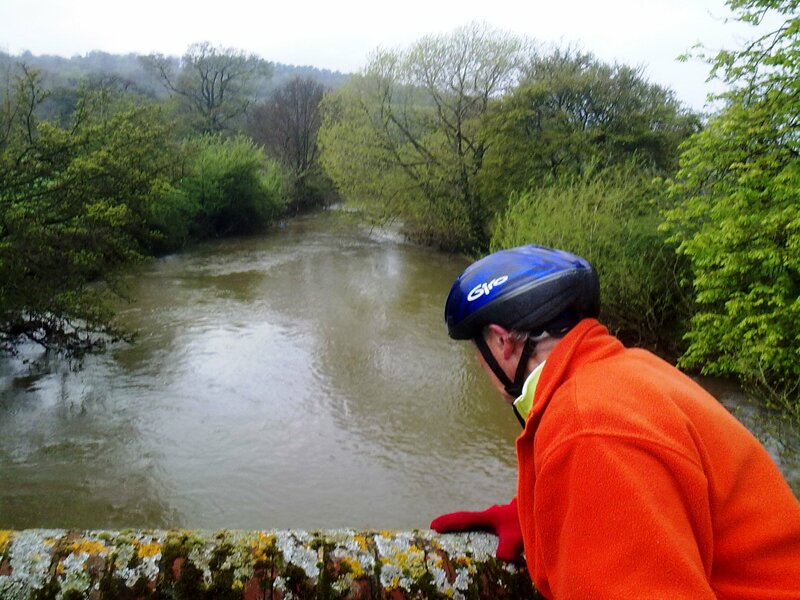 From Mickleham we continued onto the cycle path alongside the A24 and onto Leatherhead. A bit more history! The lane throughMickleham, named The Old Reigate Road, was part of the first and original coaching road from London to Brighton. Thus this old road would have been well known to the early members of the Anerley Bicycle Club. The modern dual carriageway of the A24 was build in the latter half of the 1920s and would have been much welcomed by the then Anerley B C cyclists because it, and parts of the modern A23 Brighton Rd, were built with adjacent cycle paths. It is these cycle paths from the 1920s which have been rejuvenenated for today’s pedalling fraternity. Paralleling the River Mole I took the opportunity to see what effect the recent heavy rains had had on our drought stricken rivers. The normally slow flowing Mole was a swirling, muddy brown, torrent which should help to keep our taps flowing in the coming summer months. And then it was back up past Headley Court towards Tadworth and some welcome tea and coffee, provided by birthday boy John T. And next week it is Tom Vaz’s turn as he also just had an annual anniversary! Next week will it be dry? I hope so, and hope to see you as we head off into Kent for Tom’s Teas!